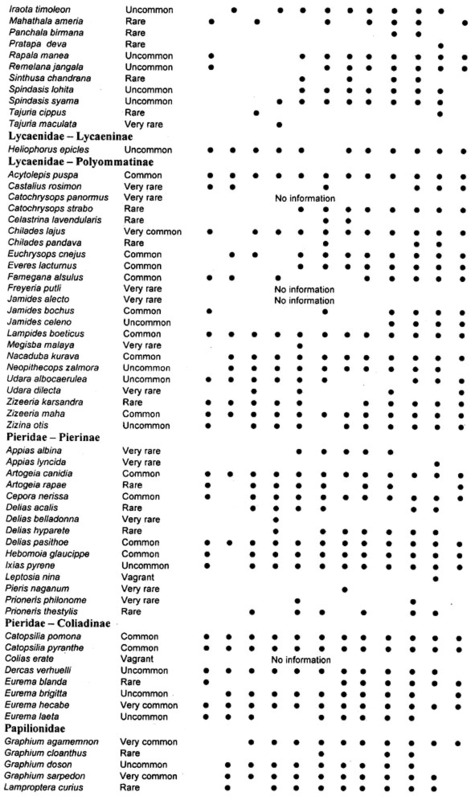 In the table below are listed 225 species of butterfly which have been recorded as occurring in Hong Kong. 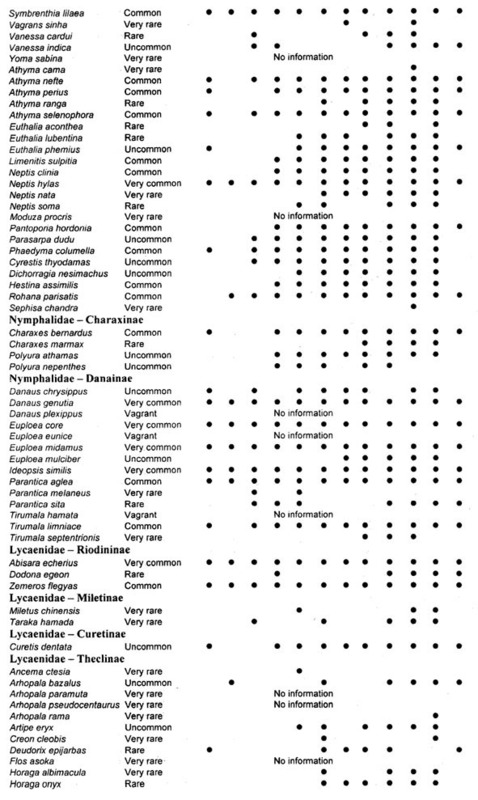 Alongside the name is the status of each species. This was determined from the frequency of occurrence in 170 one-kilometre grid squares from the New Territories, Hong Kong Island, Lantau Island, Lamma Island and Peng Chau Island. These were surveyed between 1989 and 1996. 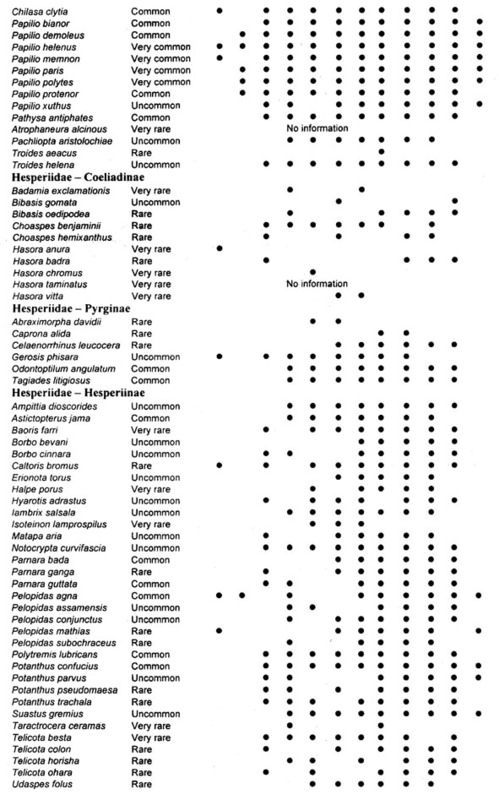 If the species was found in more than 33% of the squares, then it is described as being very common; if found in 11 % to 33%, then common: if found in 4% to 10%, then uncommon; if found in I % to 3%, then rare; and if found in less than 1% then, very rare. The status of vagrant is also used to describe a wanderer outside the normal known range (as far as can best be judged) of the species. 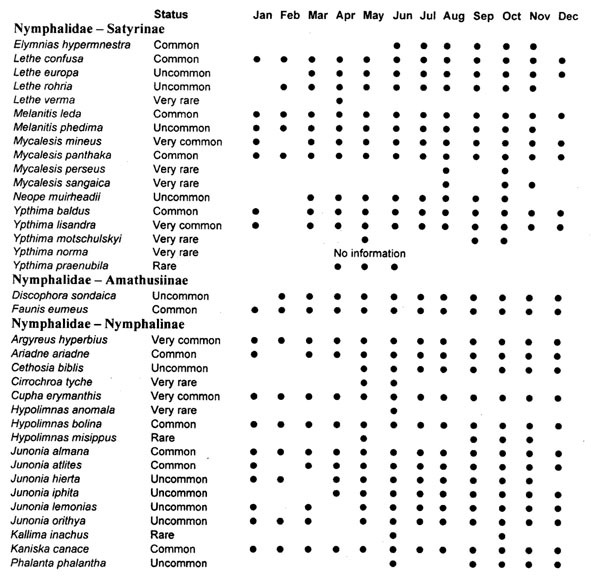 Also given in the remaining columns are the months when each butterfly has been seen flying in Hong Kong. This has been found from 6000 of my own records dating back to 1989 and supplemented by sifting through 7000 flight and capture records, belonging to Mike Bascombe, from the 1970's and early 1980's. To these I have also added several dates obtained by Graham Reels, and others from the known literature. I am indebted to Mike Bascombe for the use of his extensive database to fill in the gaps in my own records. Graham Reels kindly assisted in scouring the Hong Kong butterfly literature to fill in gaps for some very rare species.